Medical Coats There are 7 products. 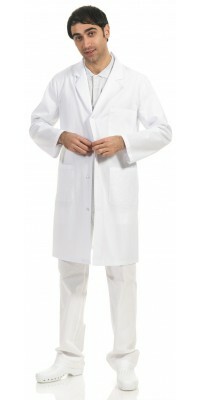 Corbara’s Professional Wear: White Medical Coats. 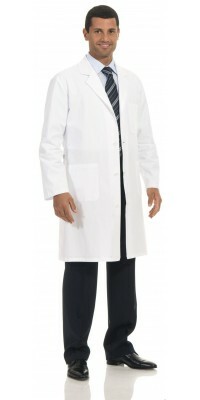 - Doctor Coat, made of pure 100% cotton Margherita Gabardine. Advantages: it’s lightweight, breathable and in natural fibre. Disadvantages: it needs a careful ironing and it crumples more easily. Recommended for: doctors and professionals that prefer a coat made of pure cotton. - Irene Coat (for women) and Raffaele Coat (for men), both made of 50% cot. 50% pol. Comfort Satin Gabardine. Advantages: it’s very breathable, long-lasting and doesn’t crumple easily. Disadvantages: it’s not in natural fibre. Recommended for: doctors, lab technicians etc. that prefer a more resistant and easy to iron garment rather than the pure cotton. 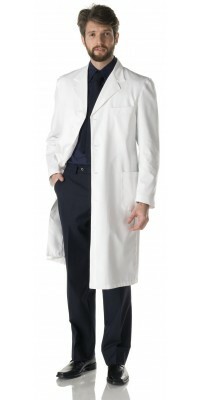 - Daniele Coat (for men) and Giulia Coat (for women), made of 65% pol. 35% cot. Pratico Poplin. Advantages: it’s long-lasting, very lightweight and easy to wash and iron. Disadvantages: it’s less breathable in summer because of the higher quantity of synthetic fibre. Recommended for: food activities and kitchen. Women's long-sleeved Coat, model IreneWhite colourImmediately available for delivery: sizes from S to XL Made of Satin Gabardine, 50% Cot., 50% Pol. "cotton on the skin"
Men's long-sleeved Coat, model Raffaele White colourImmediately available for delivery: sizes from S to XL Made of Satin Gabardine, 50% Cot., 50% Pol. "cotton on the skin"
Men's coat, model Daniele long-sleevedWhite colourImmediately available for delivery: sizes from S to XL Made of Pratico Poplin, 65% Pol., 35% Cot. Women's coat, model Giuliashort-sleevedWhite colourImmediately available for delivery: sizes from S to XL Made of Pratico Poplin, 65% Pol., 35% Cot. Women's coat, model Giulialong-sleevedWhite colourImmediately available for delivery: sizes from S to XL Made of Pratico Poplin, 65% Pol., 35% Cot.